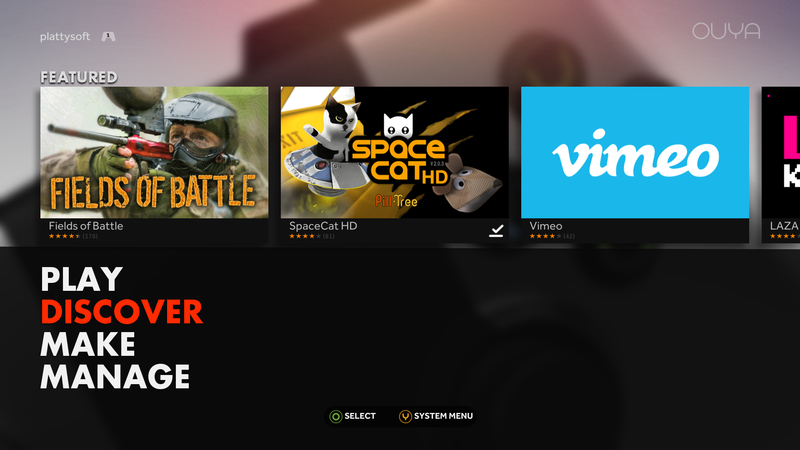 A few weeks ago I released SpaceCat HD for OUYA. SpaceCat is the only game I have that makes sense to be played with a gamepad, and because of that it supports most of the gamepads already, including Gametel, MOGA, NVidia Shield and some others. It was also ported to GameStick, but that is another story. 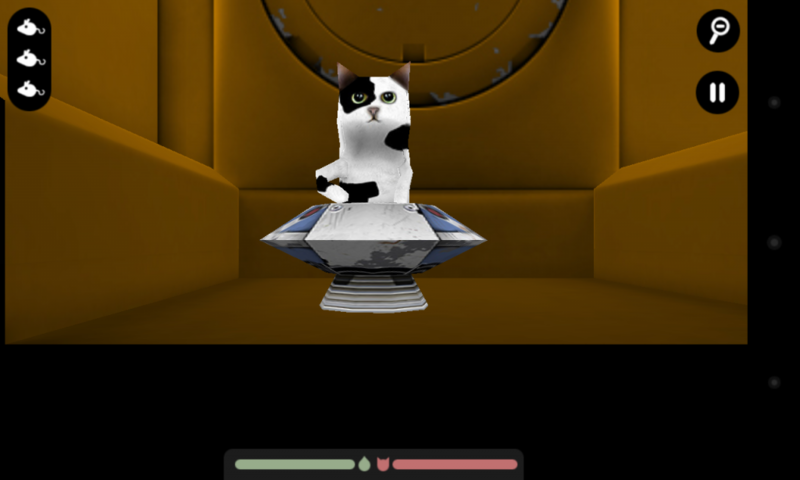 There is SpaceCat (3D), which is a Free2Play game with really low conversion. The first 24 levels are free and the remaining 24 levels can be purchased with In-App Currency. 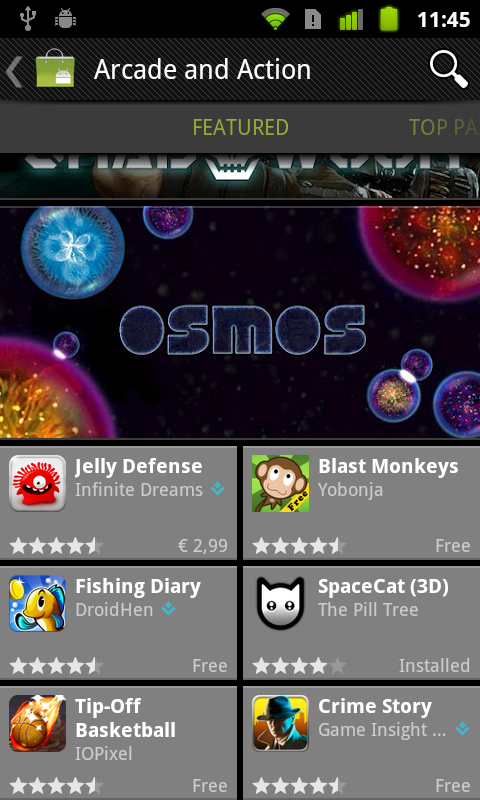 Then there is SpaceCat HD, which is a premium game. All the levels are unlocked and it has no ads. 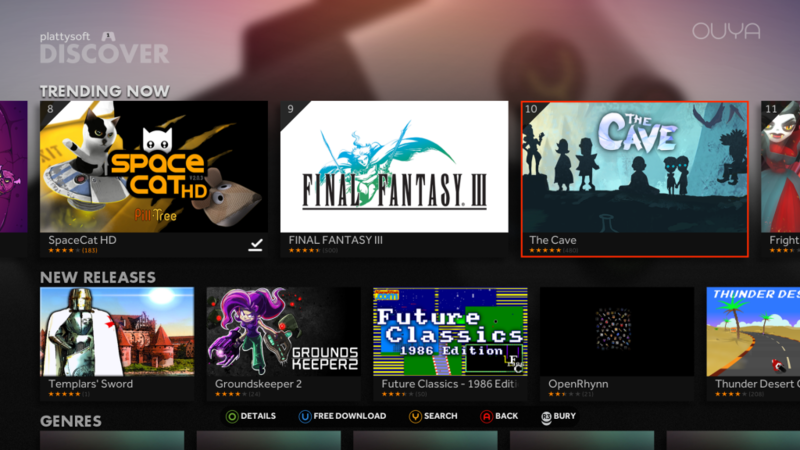 OUYA has a Free to Try mode, so I needed to find some middle ground. SpaceCat HD for OUYA has the first 9 levels for free, then the game can be unlocked with a single payment. Some other changes were required for OUYA, mainly updating some assets and strings to display the special names of the buttons. Also reimplement In-App purchases to use the OUYA library. All in all, It was actually quite straight forward. One of the best things of OUYA is that it is a much better App Store than Google Play. New releases get visibility, so does the top 30 games and so does the hand-picked features. There are about 20 new games released each week, so you can expect to be in the home screen for about a week. Be aware that the screen has space for 4.5 tiles and to see the rest users have to scroll. Your first day is probably going to be the best. This is the chart of the downloads of SpaceCat during the first weeks on OUYA. We have a solid start on the first 2 days when there were ~75 downloads. This is when SpaceCat HD was on the top of “New Releases”. As you can see, the longer the users have to scroll to find you, the less downloads you get. Then SpaceCat was featured. That put it on the front. It was the first thing you saw when you start your OUYA, literally the best spot, and it really made a difference: Over 125 downloads per day. After a few days, the feature games rotate, and you can see how the downloads per day get down to just 50. But here comes the last factor. Given the amount of people that downloaded (and played) the game, it also made it into the top 8 of the trending games, which helped it getting a decent amount of downloads. I’m proud to say that it even topped Final Fantasy III. But after the featuring, and given that SpaceCat is a game you usually play for a week and you either finish it or get bored, it slowly disappeared from the top 30 and not it only gets a few installs per day. 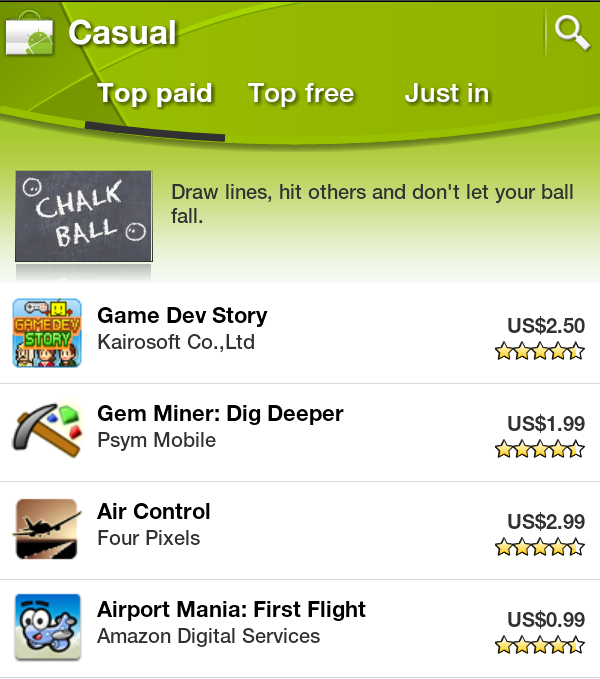 How does it compare to Google Play? The amount of downloads is in a complete different league. When SpaceCat was featured on Google Play (on 2012) it was getting over 50,000 downloads per day, 400 times more than on OUYA, Even today, SpaceCat (3D) get about 100 downloads per day. But, partly because the monetization is different and partly because of the public is different, the percentage of users that purchased the game is way higher on OUYA than on Google Play. The conversion of SpaceCat HD on OUYA is over 5%. Which is very impressive. Also, there is the human aspect. The people from OUYA were a pleasure to work with: Diligent, responsive and professional. Google Play has improved that, but they still have a long road to go. There is a chicken-and-egg problem with OUYA: There are not many players, so it is not worth developing for it alone. Since there are not many games for OUYA (750 is still an impressive amount), it is not very attractive for players. OUYA has the Free the games initiative to break the vicious circle. I like it, and I really hope they succeed. If you have a game that already supports gamepads, you should totally port it to OUYA, it is not much work and it is a very rewarding platform. If you have a good game, the chances of being featured are very high, and that is always nice. I wish there were more OUYAS out there so I could develop a game exclusively for them, but right now it is just not viable. Time will tell. Today I announce a new version of the most popular title of The Pill Tree. We bring you SpaceCat HD. 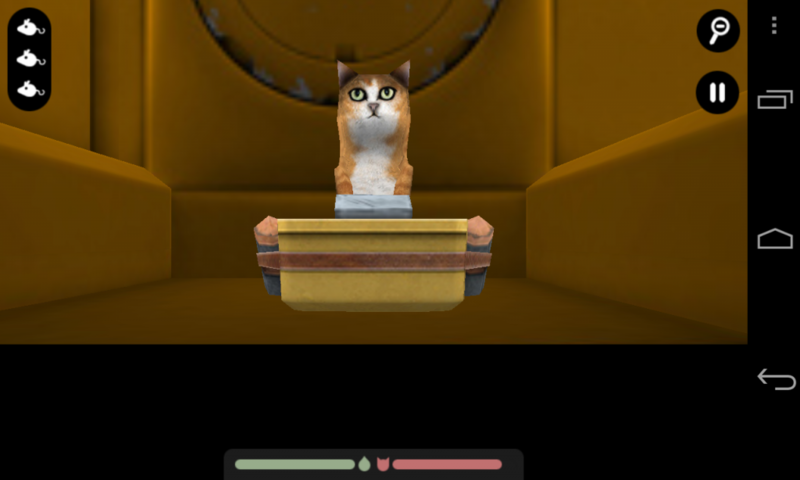 Back in 2011, when we were developing SpaceCat, phones did not had enough memory and we had to reduce the size of the textures to make the game playable. Some tears were spilled when downsizing the textures, but it was necessary. Today, that is no longer a limitation. Modern devices can use the original textures without any problem, so we have put them back. Check the scenarios and how they look a lot better.